Next up to-be-read: I'm not quite sure, anymore! The thing is, The Little Drummer Girl by John le Carre, though very interesting and action-packed, is much longer than I figured it would be. The print is very small and the pages are kind of large, so I am flitting between this awesome spy novel that I've been reading for hours now and shorter reads. I read and liked Turn of the Screw by Henry James; it reminded me vaguely of a movie I had once seen, and I realized after a quick Google search that it was actually the book that inspired the movie The Others. It's slightly dramatic and overdone and really more of a psychological horror story than the ghost story that the blurb on the back says it is. Still, a quick, good read! 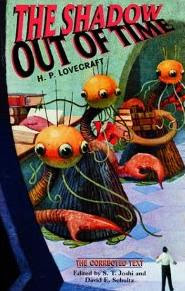 And then, I just finished reading The Shadow Out of Time by H. P. Lovecraft. Ah, Lovecraft. It's a great story. I love how Lovecraft never bothers with a good introduction or slowly inching his way into the messy, weird stuff; instead he just dives right in, and pretty much shocks you to the core of your being. Amazing book; reminded me why I loved The Case of Charles Dexter Ward so much. Now I am signing off, till the end of the readathon, to... you know, just relax, cuddle up in bed and read. I will post a sort of master update at the end of the readathon, with all my reading stats and books I read, along with, (assuming I manage to stay awake that long) mini-reviews of all the books I manage to read in the remaining time. Happy Reading!! You're doing great so far! Signing off from the computer is probably a very smart idea, I'm sure you're going to get a whole lot of reading done! Don't be afraid to take a few breaks now and then, because that'll help you read faster, and you'll feel so much better after a break. =) Keep going!! You're doing amazing! Good luck getting to the end, and congrats for making it this far! its 2:46 what book are you reading now? I'm wide awake stopping by all those that are reading and leaving my cheers along the way.